Visual Astronomy: See Jupiter's "Great Red Spot"
See Jupiter's "Great Red Spot"
Most people have seen a picture of Jupiter at least once before. And many of these people would notice that in every picture of Jupiter, there is a "great red spot" on the planet's Southern hemisphere. This Great Red Spot is actually a storm that has been raging for centuries. While the cause of this ongoing storm is unknown, we do know that it spins counter-clockwise. This means that unlike storms on Earth (which are low-pressure systems), the Great Red Spot is a high pressure system. This storm makes a great target for amateur telescopes! The Great Red Spot will be visible in even modestly sized backyard telescopes, and can be seen to move across the planet's disc. In order to see this huge storm, however, you must know when to look at Jupiter to see it. This is where Sky and Telescope's Great Red Spot transit calculator comes in handy. 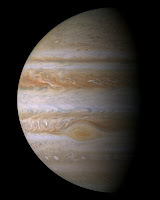 It tells you, in local time, when to check out Jupiter to see the Great Red Spot. They also have a text list to print out so you can take it out to the telescope. Now, of course, only the ones occurring during the night will be visible to observers. Any content could be very inspiring and additionally revealing. Now I’m thinking about to select work push this kind of comes with really helped others by means of taking care of. At this time follow-up payday loans oceanside Regards boyfriend!